They filmed my talk at TechEd last week and made if available on the internet. You can watch here. Unfortunately the video of the code (about 85% of the session) is not as clear as I would like but you should be able to see it. You must register at https://www.clicktoattend.com/invitation.aspx?code=132141 in order to be admitted to the building and attend. Microsoft introduced several new data access technologies in .NET 3.5 SP1. Which one should you use? Entity Framework? Dynamic Data? ADO.NET Data Services (Astoria)? Linq? POADN? (Plain old ADO .NET) What about ORMs? Has Microsoft lost its mind? Join Stephen in a discussion on Data Access Methodologies for the 21st Century, including a discussion of ATOM over REST. Note: This will require some audience participation. Stephen Forte is Chief Strategy Officer of Telerik, a leading vendor in .NET components. Prior to his position at Telerik, Stephen was the Chief Technology Officer (CTO) and co-founder of Corzen, Inc, a New York based provider of online market research data for Wall Street Firms. Corzen was acquired by Wanted Technologies (TXV: WAN) in 2007. Stephen is also the Microsoft Regional Director for the NY Metro region and speaks regularly at industry conferences around the world. He has written several books on application and database development including Programming Microsoft SQL Server 2008 (MS Press). Prior to Corzen, Stephen served as the CTO of Zagat Survey in New York City and also was co-founder and CTO of the New York based software consulting firm The Aurora Development Group. He is currently an MVP, INETA speaker and is the co-moderator and founder of the NYC .NET Developer Group. Stephen has an MBA from the City University of New York (Baruch College). Stephen is also a certified scrum master. A lot of RDs arrived in Barcelona yesterday to start TechED Europe 2008. We went out for some tapas and sangria last night and the bill came to 779 euros. 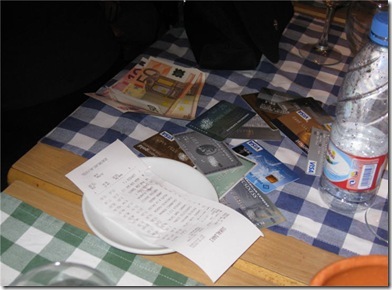 What happens when you get 15 RDs trying to split the bill with their credit card? Chaos. Here is a cool TSQL tip I will be showing off next week at TechEd Europe at one of my sessions (Rock Star Common Table Expressions). Next inside of a console application we create a new Uri to point to the Astoria service on my server. Then we will query the service using the Astoria Uri syntax ?$filter= and add that to the Uri. After that is real simple, just loop through the customers and do whatever you want with them. Pretty easy! In a future blog post I will show you how to use the traditional LINQ operands (from, where, select) against an Astoria service. Next week at TechEd Europe I will be doing two talks on Scrum (with one repeat) and we are trying something new at TechEd this year, so let me know what you think. The talk on Tuesday, DVM309: Using Scrum to Run Your Projects, is a typical TechEd breakout session in lecture format with Q&A encouraged. I’ll go through slides and examples from my experience as a scrum master (and also share some of my experiences from the certified scrum master class.) This is a good overview of Scrum good for beginners or experienced scrum masters trying to scale out scrum. See you all there… If you can’t make it, I hope they will film it and put it online. Yesterday I showed how there are some new language constructs in TSQL that will be very familiar to C# developers. I will be doing three talks on TSQL next week at TechED Developers in Barcelona and the talks are designed for application developers. (But database geeks will enjoy these sessions as well!) If you write any TSQL code in your applications today, or interact with it, these sessions will give you some advice and help change the way you approach particular problems. Next create the TVP by declaring a new type. Notice that I have created the type to be exactly the same shape as the underlying table, this is not a requirement, however, it is important to do so if you are going to be doing inserts as we do below. But what is really exciting is calling this data from a .NET client. If you have an ADO .NET dataset that is the same shape of the TVP you can pass it in from the client to the server, greatly enhancing data access and batch operations.You can pass in a dataset as a parameter using the SqlDbType.Structured as its data type. Pretty easy! Now you can pass data sets in as parameters to a stored procedure, eliminating some funky parsing on either the client or server. 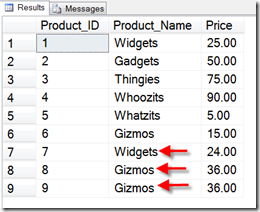 DAT313 T-SQL Enhancements in SQL Server 2008 : Getting Down and Dirty. it is Wednesday at 1:30 in room 115. So the TSQL designers decided to add a few “delighters” to the syntax to make C# and VB developers feel more at home. The addition of Table Value Parameters (TVPs) allows you to pass in datasets via ADO.NET in C#/VB as a parameter to a stored procedure, etc, will really make C# developers life easier (demo soon on the blog). Also cool integration with Google Maps or Virtual Earth and the geospacial data types will make developing apps with location much easier. There are lots of other cool new features in there for developers, I will post some more on the blog soon. I have been a fan of the cloud since Amazon first released its first APIs. We have been waiting for Microsoft to enter in the cloud space and we have been seeing some stuff drip out over the last year, Astoria (while not cloud, it is a RESTful service that allows us to be cloud ready), Live Mesh (which people confuse as a consumer offering, but actually is a development platform), and SQL Server Data Services (SSDS). Last week at PDC, Microsoft spoke abut Windows Azure, its cloud services platform. It will consist of web application and service hosting, .NET Services (basically the BizTalk services stack), storage, and data services (SSDS, or now just SDS). Some developers at the PDC were like “this is like the ASP model ten years ago, Azure is doomed to fail.” So the question is, will Azure succeed where the ASP model failed? The ASP model was about a generic application hosted by an ISP and sold as a service to you. Picture instead of using ADP for your accounting software, you would log onto the ADP web site and use it as a service. This model did not completely fail, but it did not deliver on its mission. It was also a lot of .com hype and about 10-15 years ahead of its time with both the technology and the business acceptance. While things like Live Services and hosted Exchange is part of Azure, Azure is not about ASP, but about Hosting your app, services, and data in the cloud. There is a need for this: Amazon EC2 and S3 are quite successful, even with the crowd that you think would never put their data in the cloud: Banks. It will take time, but companies will buy into this paradigm and make the shift. The first thing to go into the cloud in masse will be hosted Exchange, then file server capabilities, then applications, then data. Small businesses will go first. It may take years for the shift to be complete, but it will happen. It just makes sense to have your applications hosted in the cloud, why bother and worry about the infrastructure. Infrastructure will be a commodity by 2012. By then most new apps will be hosted in the cloud or using the cloud infrastructure for .NET Services or data. Only 12 years too late! During the .com era, when I was a CTO of a large .com, I spent 65% of my time worrying about the infrastructure (bandwidth, RAID arrays, load balancing, switches, etc.) Years later at Corzen to support our spidering engines, I focused on infrastructure about 50% (only reason why it was lower than .com era was due to virtualization.) Now I need more bandwidth, more load balancing, it is just a click of a button. Sure it is not going to be this easy, but even if it delivers on 50% of its vision, it will reduce my focus on infrastructure by 95%. .NET Services (formerly BizTalk Services) in the cloud will get adopted by developers as it matures and as apps get moved to the cloud. SQL Services will get adopted in version 2 when you can do more relational features just as tables, joins, views, etc, instead of the “flexible entities” approach of the first release. Bottom line is that Azure will succeed, but it will take time for the world to catch up to Microsoft’s vision. Amazon (and to some degree Google) have paved the way. Ok, ok it is not a Smackdown, but more of a review of Sp1 technology: EF, Dynamic Data, Astoria, LINQ to REST. I will be doing a session at TechED next week in Barcelona, however, you can see a shortened version of the talk from my DevReach keynote. Why not? I got home late last night from PDC and decided to stay up late, watch some TV and install my pre-beta version of Windows 7 on my spare laptop. The installation went very well and I decided to take some of the new features out for a spin. While there are some bells and whistles out there for the consumer, however, for a developer I really like the the virtual machine support. I was able to load up my VHDs really fast and even set a VHD as a boot partition (wow!). The VHD support is so good that I am considering bringing this Windows 7 laptop to TechEd in Barcelona and do all of my sessions off the Win 7 laptop. It has only been one day but Windows 7 appears very stable, has good power management, and is fast. It also is pretty slick looking with the Avalon UI stuff turned on. If my experience changes, I will report it back here.